It’s difficult to get real-time alerts about articles with specific headlines on specific subjects from specific websites. News reader applications like Feedly or Flipboard are great for browsing and even searching through news items, but they lack the ability to send notifications proactively. Emails from Google Alerts can be tardy, and at other times, articles can slip by completely. Never fear! Used together, two web applications, IFTTT and Feed Rinse, solve this problem easily. In this tutorial, I’ll show you how to use Feed Rinse to combine and filter RSS feeds for use with IFTTT. IFTTT is a web application that automates common tasks like posting to social media or sending emails. If you’re new to IFTTT, check out this tutorial on how to get started. To get our alerts, we’re going to use IFTTT’s SMS channel. To activate the SMS channel, you’ll have to enter your mobile phone number. Once you activate the SMS channel, you can use it in any IFTTT recipe. 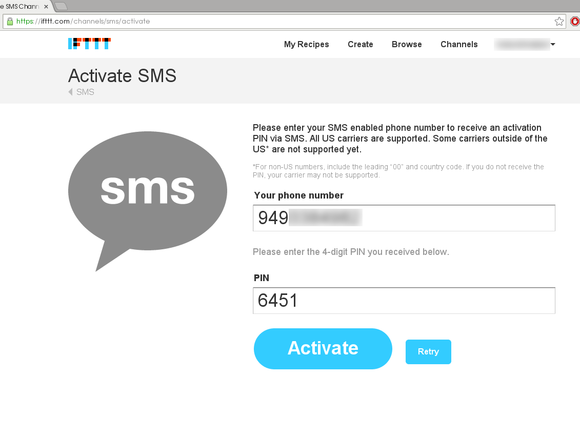 After you enter your mobile number, IFTTT will send you an SMS with a confirmation code. Enter the confirmation code in the text box labeled PIN, and the channel will be activated. Be sure to label the IFTTT phone number in your address book, so you’ll know where the SMS messages are coming from. Feed Rinse is a free web application that filters RSS feeds according to user-specified criteria. After signing up for an account, log into the web service. On the welcome screen, you’ll see an empty list with two tabs. We’ll deal with those soon enough, but first we need to add our news sources. A basic version of a feed icon. Most news websites and blogs supply links to their RSS news feeds. The links are usually at the top or bottom of the page. Try looking for the feed icon, which looks like a dot with two larger quarter circles, resembling radio waves. For our example we need to locate the feeds for PCWorld’s website. First, open up the PCWorld website in a new tab. 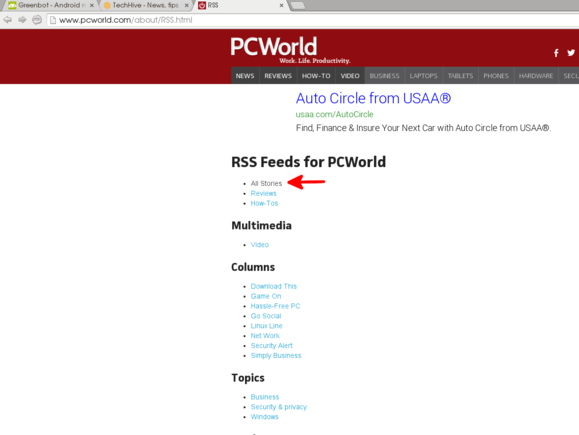 Next, find the link to PCWorld’s RSS feeds near the bottom of the webpage. Most blogs and news websites have RSS links on the front page. 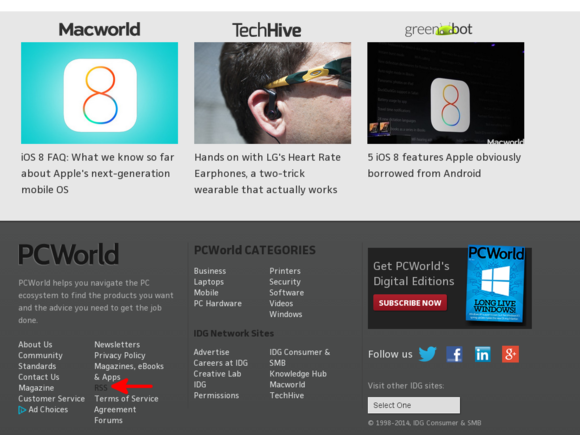 The links will often be near the top or near the bottom of the page, as shown here in PCWorld’s footer. When you click the link, you’ll find that PCWorld has several feeds. We’re going to use the main news feed. That way, Feed Rinse will search every article that gets published. Some websites may offer more than one RSS feed for you to use, often separated by section or subject matter. After you click the link to the feed, copy the feed URL from the address bar or your browser. Most RSS feeds are simply XML files with links to a website’s new content. 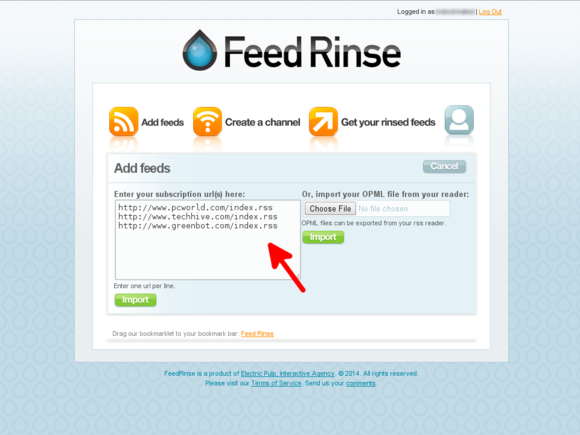 In Feed Rinse, click the Add feeds button. On the left side, you should see a text box labeled ‘Enter your subscription url(s) here.’ Paste the feed URL that you copied from the PCWorld browser tab. You can add multiple feeds at once by adding each feed on a separate line. 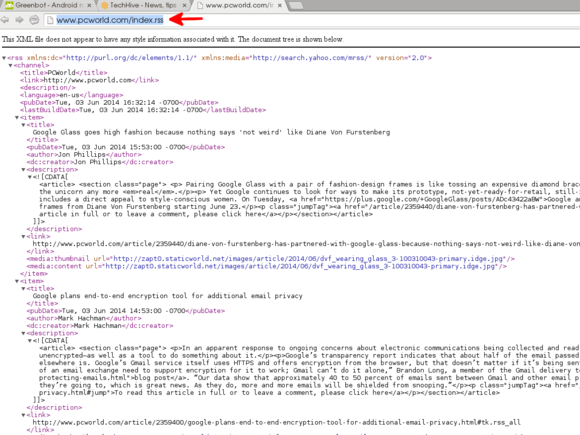 In this example, we’ll add the URLs for the TechHive and GreenBot RSS feeds as well. You can add multiple feeds to Feed Rinse at once by entering one URL per line in the text box, or uploading an OPML file. Click Import to add the feeds to your collection. Next, we’re going to create a channel in Feed Rinse that will lump all the posts from your chosen feeds together into a single feed. We’ll need this feed link for our IFTTT recipe. 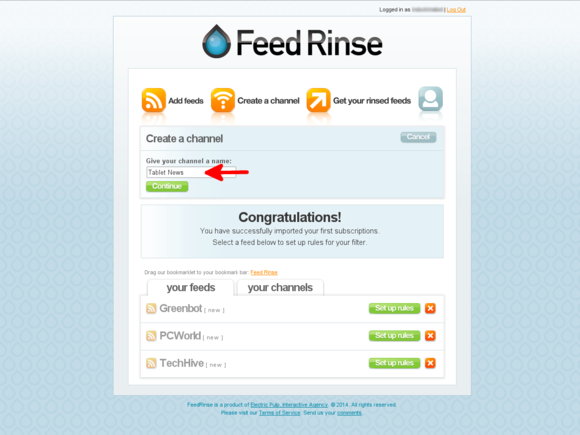 You can filter individual feeds in Feed Rinse as well, but by using a channel, you can filter several feeds at once. Click Create a channel to create a channel. Give the channel a name and click Continue. 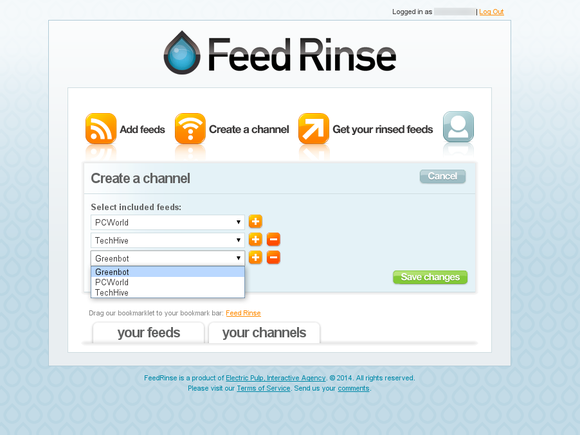 Feed Rinse allows you to combine several RSS feeds into channels that you can then filter as a single RSS feed. On the next screen, we need to add the feeds to the channel in the section labeled ‘Select included feeds.’ Select the name of the feed you want to include using the drop-down menu. To add or remove feeds from the channel, use the plus and minus buttons, respectively. Feed Rinse channels must have a minimum of one feed.